Now that spring has arrived, it’s time to move indoor parties outside to your patios, porches, and backyards! 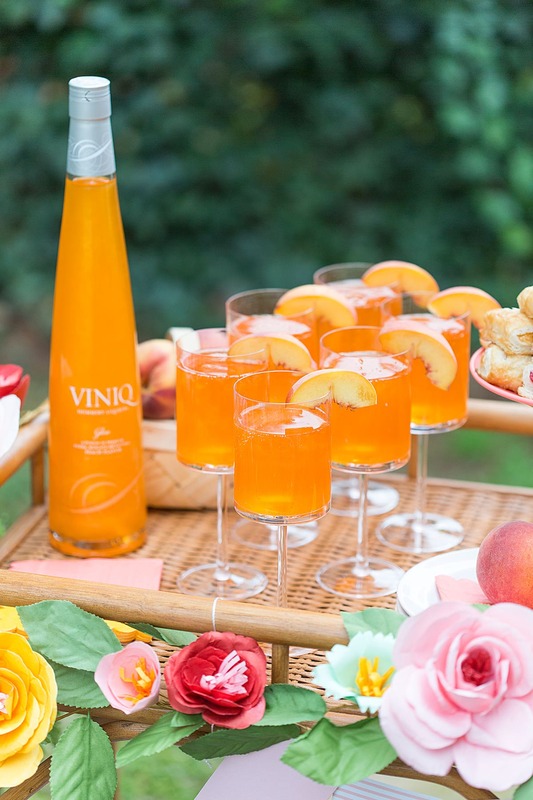 I’m super excited to help celebrate the nationwide launch of Viniq Glow and show you how to style a gorgeous spring bar cart brunch! It’s the perfect celebration for a bridal shower, baby shower, birthday party, or just a gathering of your favorite girlfriends! Bar cart parties are my favorite! It’s like a rolling party, what’s not to love? 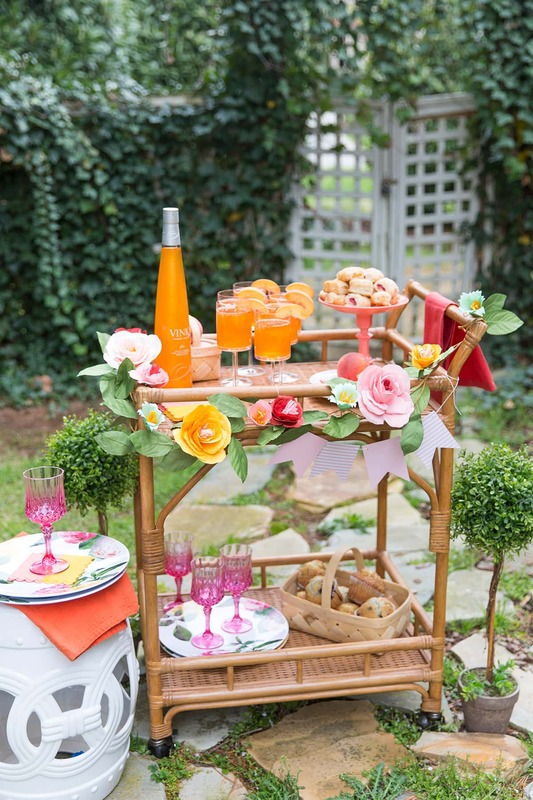 More about the tasty cocktail that inspired this brunch bar cart! I love Bellinis but Bellinis with a little shimmer?! Sip sip hooray, y’all! Viniq Glow tastes like ripe, juicy peaches with a beautiful shimmer (it’s the coolest) making this cocktail oh so sassy and fun, not to mention delish. Sip sip hooray! 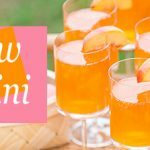 You'll love this Glow Bellini! Combine chilled Viniq Glow and champagne. 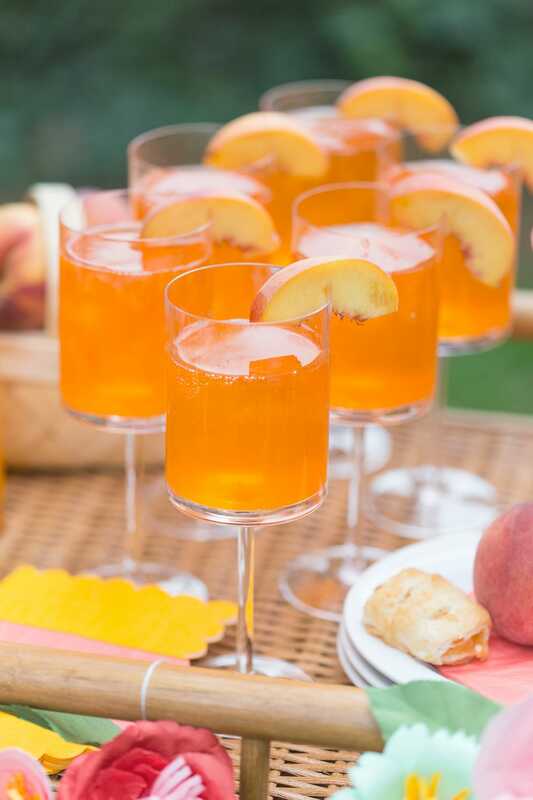 Garnish with a peach slice and sip in style! So how do you take this fabulous cocktail from a drink to a whole bar cart brunch party? 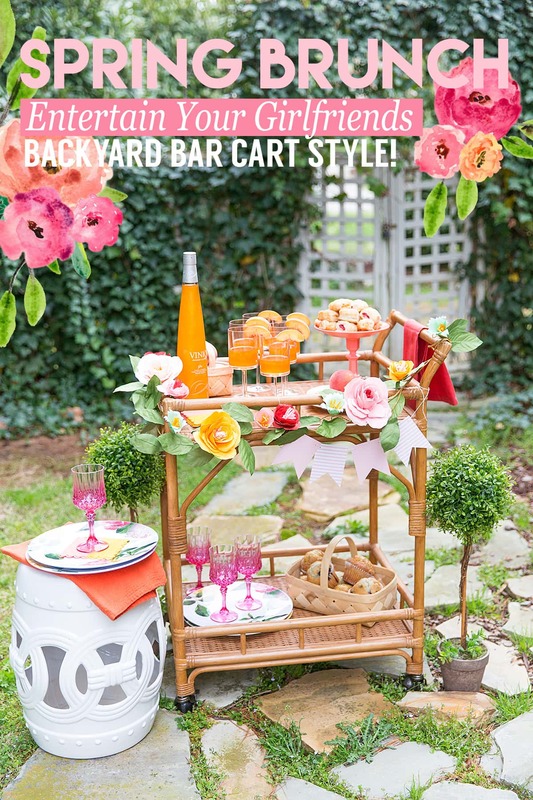 Here are my top 5 tips for styling a spring bar cart party! Peaches, pinks, and yellows! 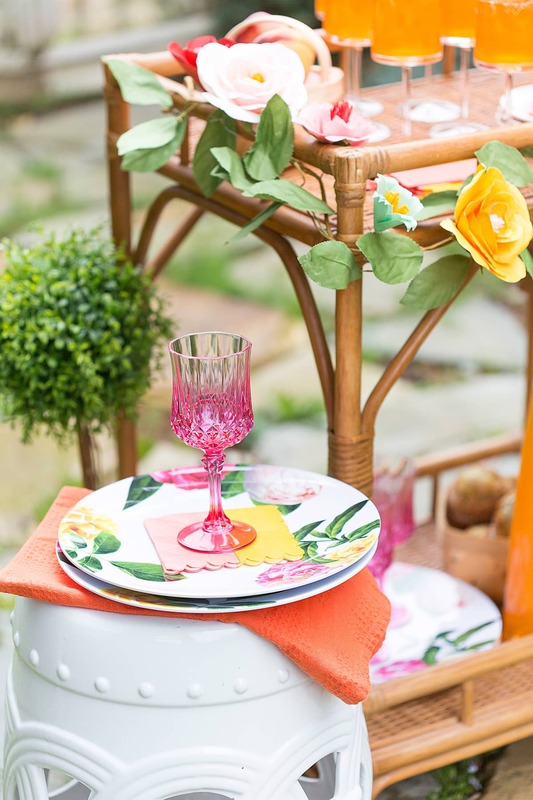 Keep your color scheme on par with your cocktail so pull together napkins, plates, and party accessories in the sunrise hues. 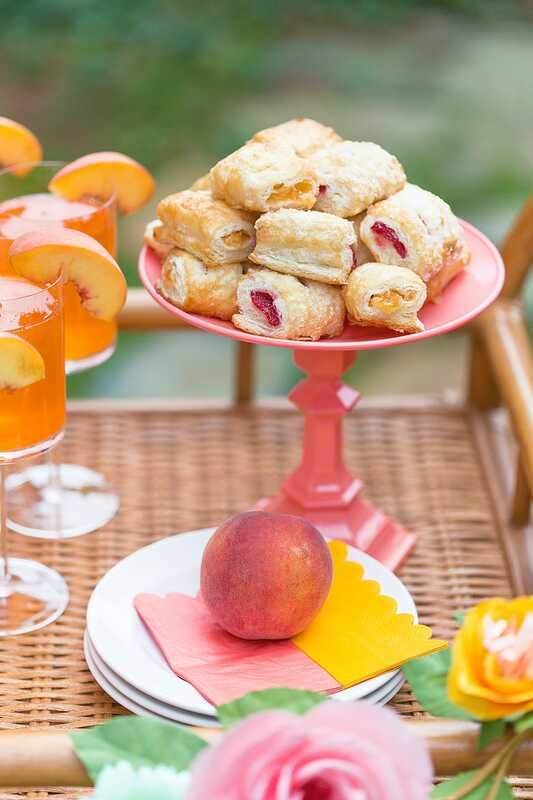 You can always add in white plates with a fun pinky peach napkin, for example. Serve up brunch food! Keep it simple and visit your favorite bakery for fresh muffins and mini pastries. I served up mini peach pastries and a variety of muffins. A peachy pink cake stand makes the perfect display for your treats. You can also use fruit baskets (check craft stores!) to carry out the peach theme! 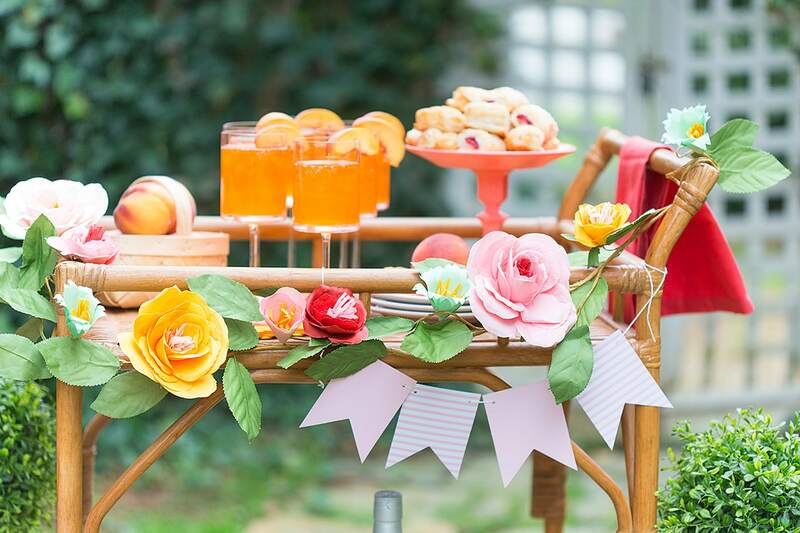 Decorate your bar cart party with extra peaches for pops of color. This also helps carry out your theme. Give out a little basket of fresh peaches as an adorable favor! Give your bar cart a little flair with a garland of flowers! You can use anything from real ivy to a paper flower garland like the one I used. You can also use silk flowers from a craft store adorned on to ribbon or directly on to the bar cart with wire or clear fishing line. There are lots of ways to recreate this look, and it really gives the bar cart party that festive touch! Cheers in style! You definitely want to serve up a signature cocktail (hello Glow Bellinis!) that fits your theme. Now it’s time for you to bring the shimmer! 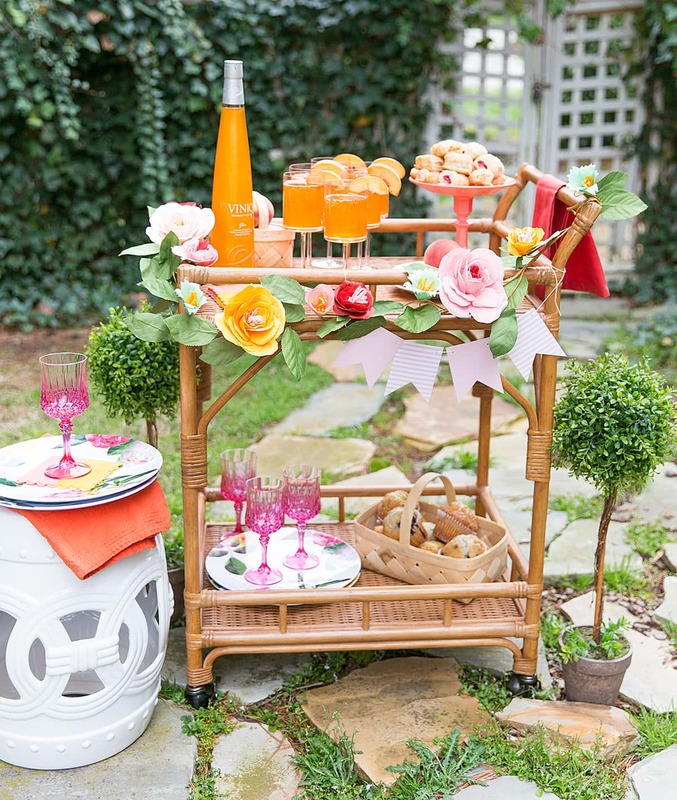 Invite your gal pals over, host a spring bar cart party – Pizzazzerie style, and share the photos! Use the hashtag #bringtheshimmer and share you fave VINIQ pics to be seen on the Bringtheshimmer.com site alongside mine! Thanks for supporting our brand sponsors like VINIQ that allow us to continue sharing entertaining inspiration! from were are the glasses? I found them at HomeGoods.